Mederma has certainly been gaining a lot of attention lately, mainly for their Mederma PM Intensive Overnight Scar Cream product that has been aired on national TV commercials quite a bit as of late. So, we decided it was high time we wrote a proper review for it. Below we’ve provided general information about the product, reviews from real consumers that bought Mederma PM, our own personal opinion of it, and more. Mederma PM is a moderately good scar removal cream. Generally speaking, most people see decent results from using it. We do, however, recommend using Kelo-Cote Gel for better, faster results. Mederma PM is a scar removal cream that is designed to be put on at night. Supposedly the idea behind this was that when you’re sleeping your body is actually working harder to repair skin damage and your cells regenerate a good bit faster. So having a topical treatment working to aid that process while you’re asleep would, in theory, help to reduce the appearance of scars greatly. The cream contains a variety of peptides, collagen, and antioxidants that are supposed to work together to improve skin complexion, fade the darkened or pigmented skin where scars are, and get rid of nasty free radicals. 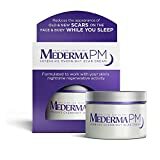 Mederma claims that the PM Intensive Overnight Cream has been clinically proven to fade scars and can produce visible results after just 2 weeks of use. We picked up the product and tested it on a couple of scars over the course of a month (30 days is typically a good time frame to see whether or not a cosmetic will actually work). With using the Mederma PM Intensive Overnight Scar Cream we did notice some results after about 20 days of use. It was nothing to write home about, just a minor improvement honestly. All in all, this product isn’t going to perform miracles. Regular usage over the course of several months will likely help fade the discoloration in things like acne scars, but for deep surgical scars it won’t make a considerable dent. Below we discuss alternative products, services, and more that provide better, faster results. Proven effective by some people, but again not true for all customers who have used it. As with every other cosmetic product in the world it’s very important to know what they’re made up of. Below we’ve provided a list of both the active and inactive ingredients round in Mederma PM. NOTE: Please note that this list was collected from other websites and may or may not be a complete index of ingredients found in this product. Always be sure to consult a doctor or physician before beginning use of any cosmetic treatment. This stuff works!! I’m a African American and I had back acne really bad and then had acne scars for the aftermath. It was terrible. Buuuttt Mederma has been clearing it up really well! I’ve been using for a good 3 months and love the results. Will continue to use! This worked well with fading some dark spots I had. This won’t completely take away dark spots that have been there for years, but it worked for me on some of my more recent dark spots. As we mentioned above, we didn’t find the Mederma scar cream to be extremely effective. For that reason, we recommend trying another product before blowing money on this one. The product we recommend most for scar removal is Kelo-Cote Gel. This is a clinically tested, topical gel treatment for both old and new scars. Kelo-Cote works exceptionally well. It flattens out raised scars, significantly reduces redness or other discolorations around the area, and helps mend the skin back to its natural, pre-trauma state. It’s important to know, however, that you need to use the gel daily for anywhere between 1 and 3 months to get great results. The treatment duration will depend greatly on the severity of the scar you’re attempting to get rid of. Overall, though, Kelo-Cote gel is our #1 suggestion. It’s a potent formula that has proven to work better than ANY other at-home scar removal treatment we’ve tested. Kelo-Cote significantly outperforms Mederma PM Intensive Overnight Scar Cream. It is a bit more expensive, but, honestly, the results justify the cost. Kelo-Cote gel provides significant improvements and is far less costly than laser scar removal treatments or other treatment methods. You can also try using Meladerm. Technically, Meladerm is designed to treat things like dark spots and other related issues but because old scars are essentially just highly pigmented areas Meladerm will also work to gradually reduce the appearance of a scar. It has been proven to work especially well on acne scarring. We only recommend trying Meladerm if your scars are either new or not extremely noticeable. Don’t think a topical cream is going to cut it for you? If you have extremely severe scarring it is possible that a cream won’t completely get rid of the scars. The good news, however, is that there are other options that will likely work for you. The next most popular treatment method for removing scars is using a laser. Machines such as a CO2 laser or YAG laser are commonly used to gradually remove scars from the face, arms, legs, and other parts of the body. The biggest drawbacks to laser scar removal are the cost and number of treatments required. Depending on how bad your scars are, you may have to sit through several sessions to fully fade your scars. This is why the cost (compared to at-home options like Mederma PM) becomes a big issue as well. Most dermatologists or medical spas typically charge, at minimum, $200 to $300 per laser treatment. So, if you need 3-5 treatments to significantly reduce the appearance of your scarring it could easily set you back $600 to $1500 or more. The pros, however, are that laser treatments are pretty effective at removing scars. It works quickly and is incredibly beneficial both new or aged scars. We highly recommend trying a topical cream first. While the results don’t come as quickly, many people are happy with the results they receive from treatments such as Kelo-Cote or even Mederma PM. If it works for you – you’ll save a ton of money and not have to deal with the burning sensations of a laser.